The subject of this scene is really the early morning light on the grassed hillside. Pughs Lagoon is about 30 minutes from my home and a popular site for local artists. This painting was done en plein air and, as I was quite happy with the result, I thought I would go through the steps I took to complete it. Because of the rapidly changing light, these situations require quite fast painting and a clear idea of the steps you need to take to capture the subject – in this case it was the light. I was at this same location the week before so I already had a good idea of the painting I wanted to create before I arrived. Paper: Arches 300gsm Cold Pressed watercolor paper, quarter sheet (approx. 15″ x 11″ (38cm x 28cm)). Brushes: Round, sizes 24 and 16 for larger washes, and 12, 10 and 8 for smaller areas and detail. Watercolor paints: All Winsor and Newton artist’s quality, Cobalt Blue, French Ultramarine, Raw Umber, Burnt Sienna, Permanent Alizarin Crimson, Cobalt Turquoise, Aureolin and Cad Orange. Other items are: 0.7mm HB clutch pencil, fine mist spray bottle, stiff backing board, masking tape, old towel to control wetness of your brushes, tissues and simple watercolor easel. Collapsible water container. 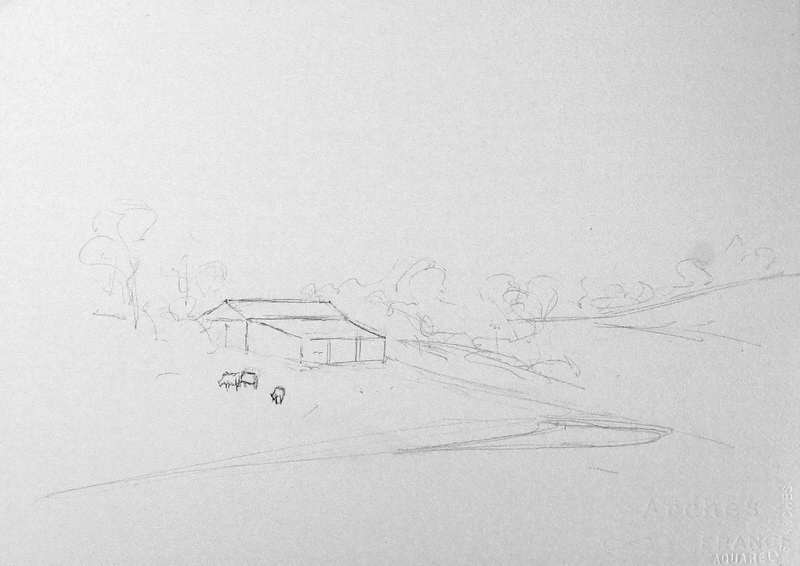 My sketch was kept light, focusing on the two buildings and the water line. I also indicated where the two major tree groupings would go. The trees were not drawn in any detail. As I was focusing on the light on the hill, I placed the waterline at about 20% up from the bottom of my watercolor paper. Once the drawing was done, it was then time for the under painting. Notice that I kept the lagoon area dry. You cannot do this section until the rest of the painting is done, otherwise you would not know what to put in the reflections. The watercolors I used for the under painting were Cobalt Blue and Cad Orange for the sky. Both were mixed with a lot of water as they would make up the lightest section of the painting. It is better for the sky to be too light than too dark. Winsor and Newton’s Cad Orange is a very yellow orange and is used with plenty of water or it will appear opaque. If your orange is too red, like with the fruit orange, it may be better to use Yellow Ochre instead. The greens were mixed with various mixes of Cobalt Turquoise, Aureolin and Raw Umber for the lighter passages. A small amount of French Ultramarine was added for the darker ones. Here and there I also used a touch of Burnt Sienna. As you can see, all the edges in the sky, tree and hill area, apart from a few left highlights, are all soft. This means they were painted wet on wet. The paper was not pre-wet. The sky was painted all the way down to the water’s edge, though with a lot more water in the mix in the hill area. I then immediately went in with the tree and grass under painting. 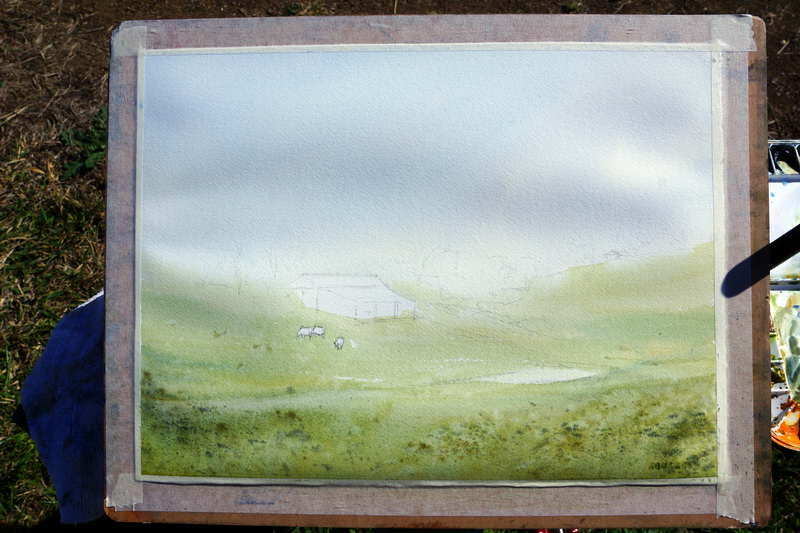 It was the wet sky wash that gave me all the lovely soft wet on wet edges for the trees and grass. The angle of my easel was at about 40 degrees. 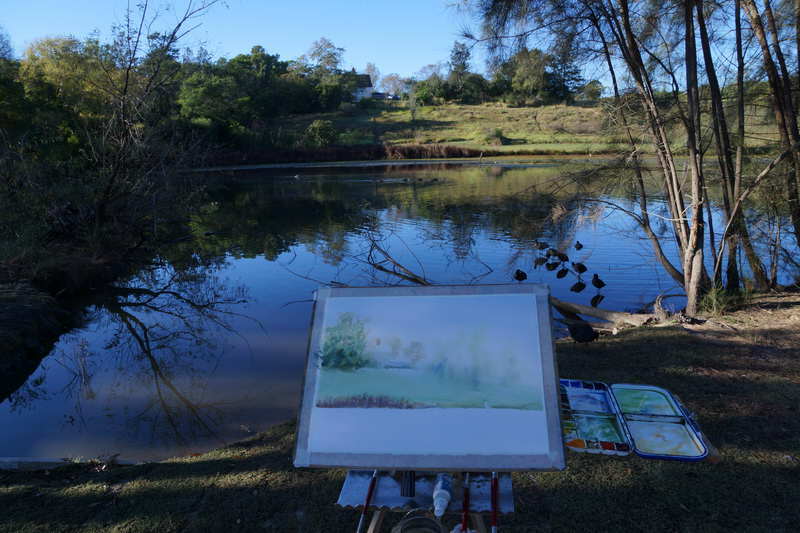 When I paint outdoors I keep my board at a steeper angle to allow me to paint with less water. The steeper board angle lets the watercolors flow as they would with more water but at a lower angle. This allows me to keep my paper a littler drier while still creating the same effects I can produce in my studio work. As I don’t have access to a hair dryer when painting outdoors, the drier I can keep my paper the faster it will dry fully so I can move on to the various stages of my painting. It still has to be wet enough for the watercolors to flow however. I let this stage dry totally – both the paint and paper. With the under painting totally dry it was time to paint the trees, shrubs and buildings. Starting on the left with the trees, I moved from left to right also painting the buildings as I moved along. The trees and shrubs were painted with the same colors as those used for the underpainting, though with varying mixtures of paint. Less water was used, creating thicker mixes to strengthen the tones, which allowed the trees to be contrasted from the grass on the hill. The sides of the buildings were painted with a very weak mix of Yellow Ochre, Burnt Sienna, and Cobalt Blue. The building in the distance had a little more blue in the mix as it was further away. The chimneys were painted with Burnt Sienna and Permanent Alizarin Crimson. The colors for the roof were French Ultramarine and Burnt Sienna. The distant roof has more water in the mix to push is further away in the picture plain. As I continued to work from left to right ­­- right to left if you are right handed – I kept varying the colors and tones used, to create an interesting composition. I took inspiration from the view in front of me but I was not constrained to place everything where I saw it. My main intention was to create an engaging work of art, not a replacement for a photograph. Once the trees and the building were completed I quickly added the shadow shapes. These not only anchored the objects to the ground but were critical to giving the painting its feeling of bright morning light. My shadows were painted with a mixture of French Ultramarine and Permanent Alizarin Crimson; the mix has to lean towards the blue not the red however. In a couple of areas I had splashed on (with my brush) some clean water. In this way, when the shadows were painted, they produced some nice soft edges as they hit the wet spot. Make sure your shadow color is already mixed before you splash on the water, or else it will dry before you start painting your shadow, thus defeating its purpose. The water was painted with the same green colors with a touch of Burnt Sienna to grey them off. Reflections on water are always a little duller than the objects being reflected. I used this time to sharpen the shapes of some of the grasses on the water’s edge with mixes of Burnt Sienna, Permanent Alizarin Crimson, and French Ultramarine. Remember to make your reflections directly below the object being reflected, and towards the bottom of your paper. I let the lagoon area dry thoroughly, and then painted the final details. 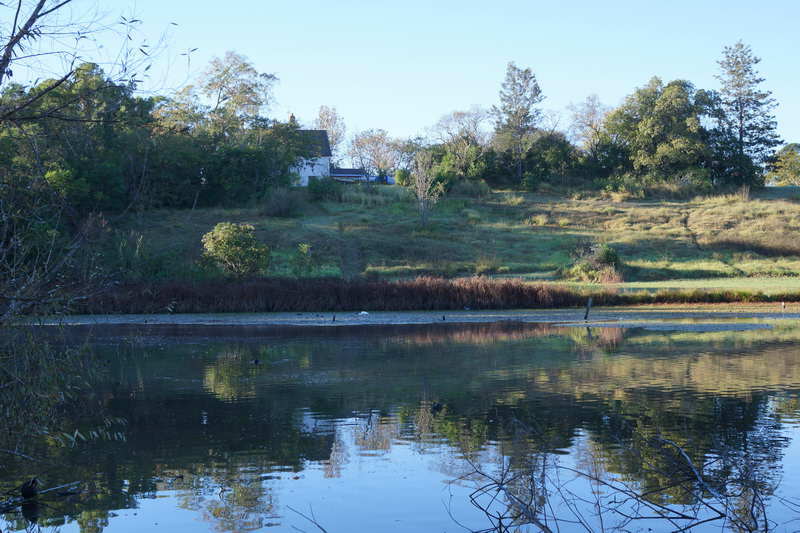 These included the birds and logs in the water along with their reflections. I also added a few clumps of grass on the hill and a small leafless tree near the buildings. I make sure not to overdo this however. Objects such as these are placed only with balance and composition in mind. Just because something is there doesn’t mean you have to include it or that you can’t move it. 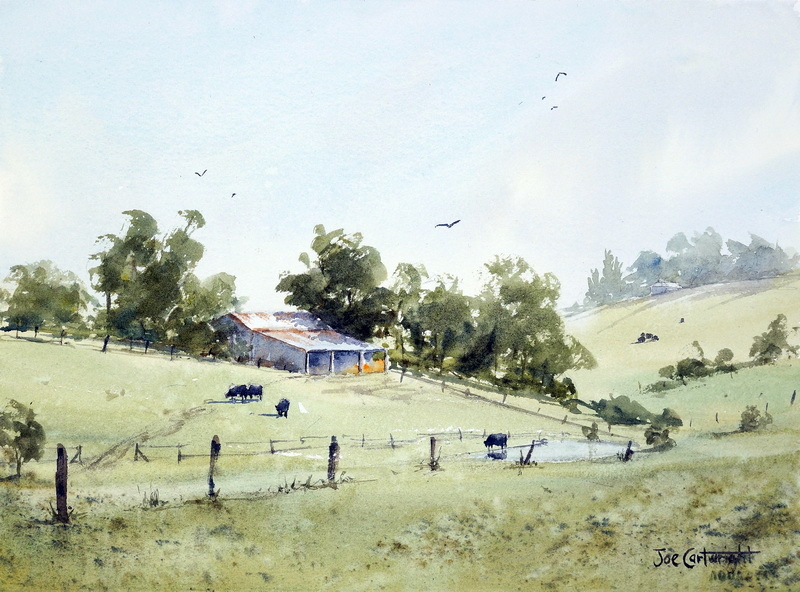 I hope this watercolor painting demonstration may inspire you to get your paints out and go plein air painting as well. 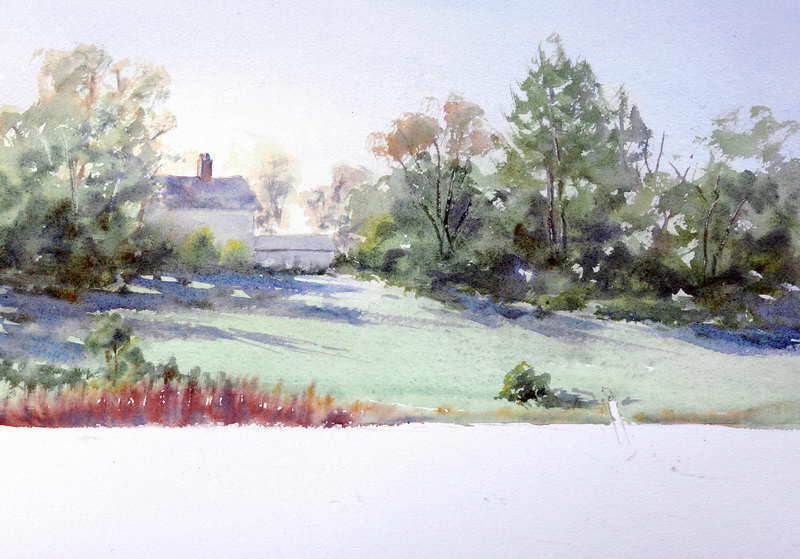 Here is today’s plein air watercolor landscape painting I did with my Thursday plein air group. 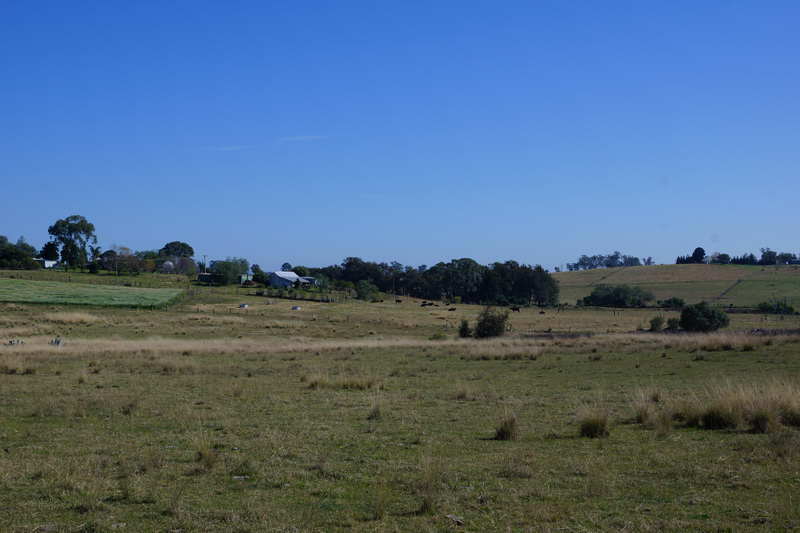 The location is in Luddenham, a semi rural area just outside of Sydney, Australia. It was a lovely day to be painting outdoors. Warm but not too hot, few clouds so no moving shadows to contend with, and no wind – perfect! I was immediately drawn to an old shed in the distance and the pattern made by the trees around it. The form of the hills would allow an interesting lead into the focal point – the shed. While the distant hill would add space to my painting. Here is the scene I was confronted with. Decide what attracts my attention in the vista along with any compositional changes I will make. Remember there are no rules that say you have to try and paint everything you see when painting outdoors. I try to work out what is the minimum I need to put into my painting while still achieving the message I want to present. Too much information can lead to a confusing message. I set up my plein air watercolor painting kit which you see below. Because the sun was already quite high in the sky I used my umbrella to shade my watercolor paper and as much of my palette as I could. 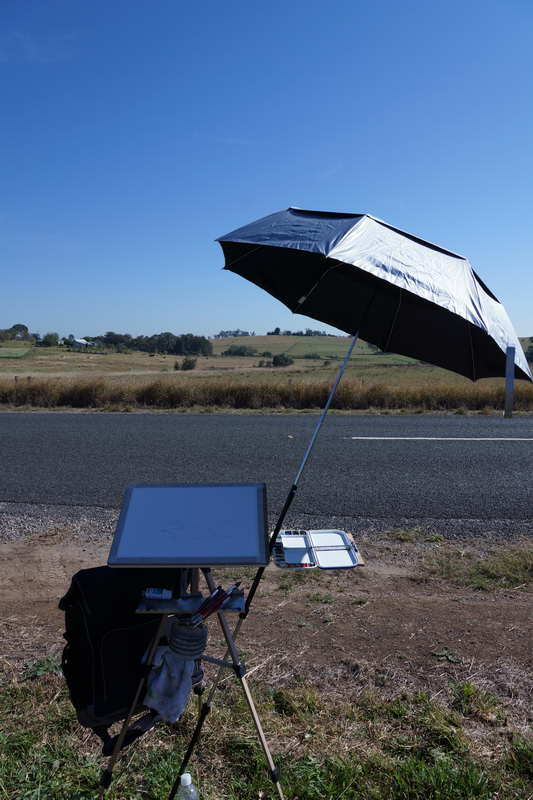 The umbrella is supported by a lightweight extendible pole and attached to my plein air easel with Velcro tape. I used my carry bag as a counterweight as my plein air easel is very light and the umbrella could have toppled it. The bag hangs on the other end of the aluminium arm that supports my little folding palette. Now that I am all set up I do a loose drawing of the scene. I am mainly interested in the general layout of shapes when doing my drawing. I do not put in a lot of detail as I want to keep the whole watercolor painting free and loose. With the drawing done my next step is to paint the sky and the ground under painting. It is very important that you get your tones right for this stage. The sky is usually the lightest tone in the landscape. The ground should be lighter, cooler, and softer in the distance. It’s tone increases as it moves towards the foreground where warmer colors are used. At this stage of the watercolor painting it should already look like a landscape, with the sky and your ground almost finished. The greens I used for the ground are made up of various mixes of Aureolin, Raw Umber, Cobalt Blue (only a little) and French Ultramarine. All these water colors a artist’s quality and made by Winsor and Newton. I take this opportunity to have a coffee and a chat while waiting for this stage to dry thoroughly. If you try to keep painting without letting the watercolor under painting dry thoroughly you risk creating mud. The painting is now well on the way. Next comes the trees and the shed. I made sure the distant tree line was lighter in tone to those around the shed. The shed is painted with a mix of Cobalt Blue and some Burnt Sienna to create a grey. The rust on the roof is created with Burnt Sienna and very little water. I used the side of my round brush and barely touched the paper. This creates a dry brush effect. This plein air watercolor landscape painting was now nearly finished. All I had to do was put in the details, the pond, cows and fence lines. These objects are all placed to help the composition. Even the birds in the sky are placed to add interest and depth to the sky. They also help direct the viewer’s eyes to where I would like them to go. The painting is finished and signed. The finished painting is below. If you have any questions please do not hesitate to let me know either through the comments section below or better yet through the forum pages. 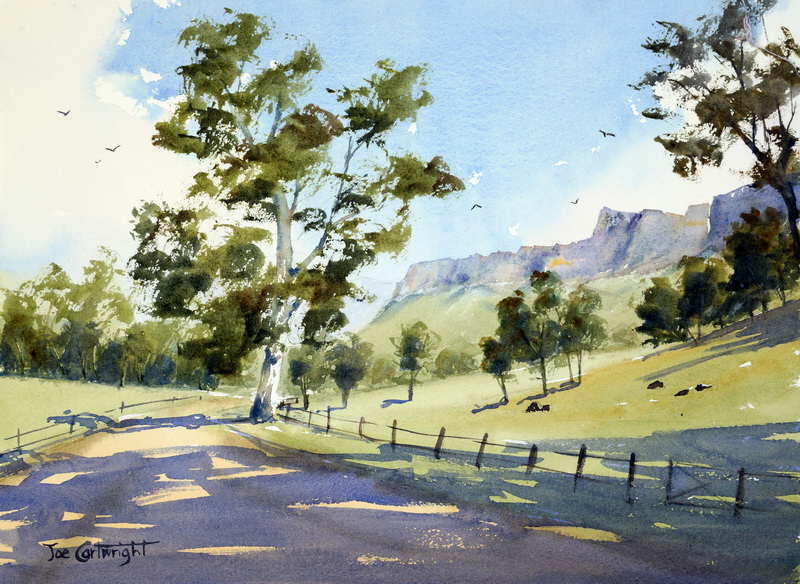 I recently ran a Pen and Wash workshop at Fay Boyds Fine Art School in Grafton, NSW, during which one of the paintings produced was a landscape of a scene in the Capertee Valley. After the workshop I painted the same scene only this time it was done purely in watercolor. I thought you might like to see the two paintings to see whether you favor the watercolor or pen and wash version. I personally like both and feel each has a place in my repertoire. Below is a photo of the scene. The pen and wash version was done quite quickly. First I did the drawing using a dip pen and permanent black ink. Very little shading was carried out with the ink which was used for outlining the scene only. I did, however, vary the pressure on my pen to give more character to the lines, especially in the sky. Once the ink was fully dry I laid a light watercolor wash over the whole painting. 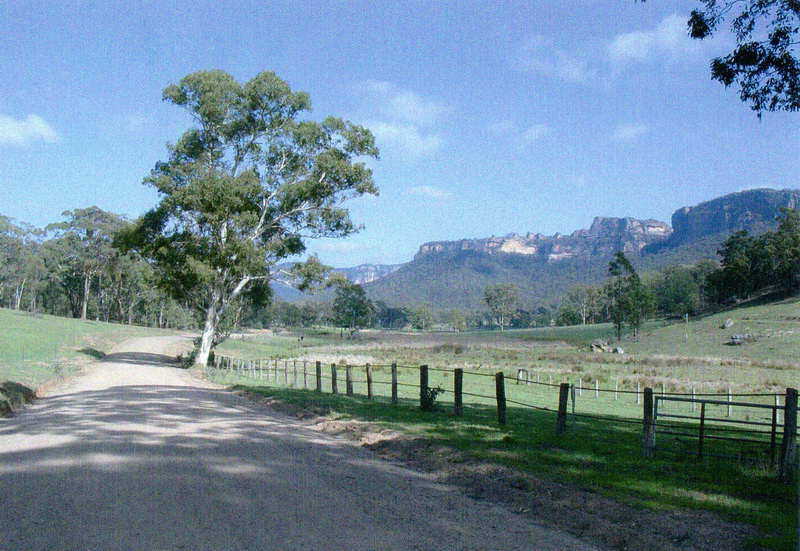 Starting with the sky, distant hills, the foreground hills and finally the dirt road. While doing the under wash I skipped little parts of the paper to add light to the painting. 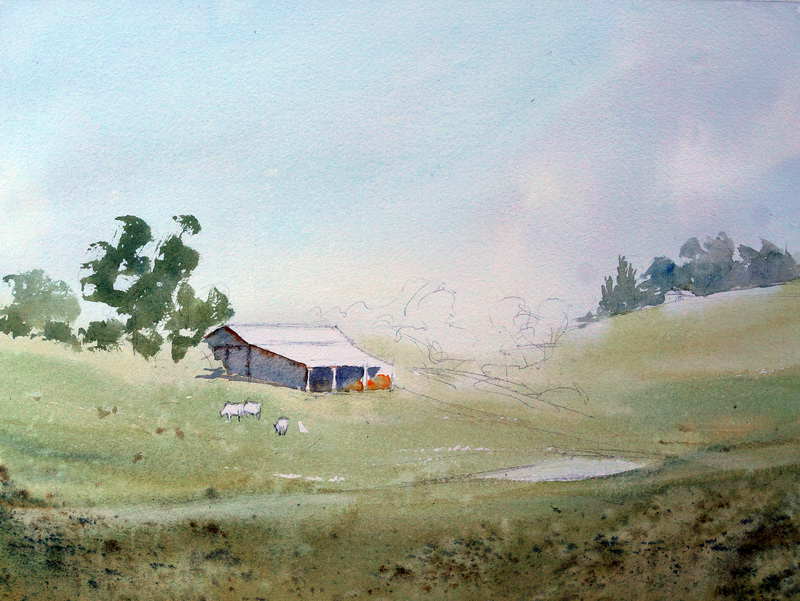 Once this was dry I went back into my watercolor painting and placed the distant and foreground trees. 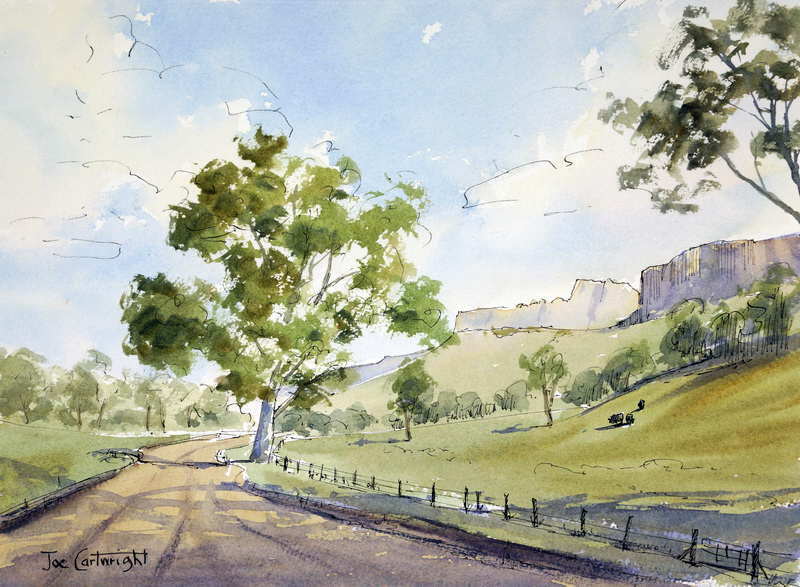 I finished it off with the shadow on the right hand side cliff face, the side of the main tree and on the road. You can see my finished Pen and Wash painting below. This next painting was done with water color only, after doing a light pencil drawing of the scene. 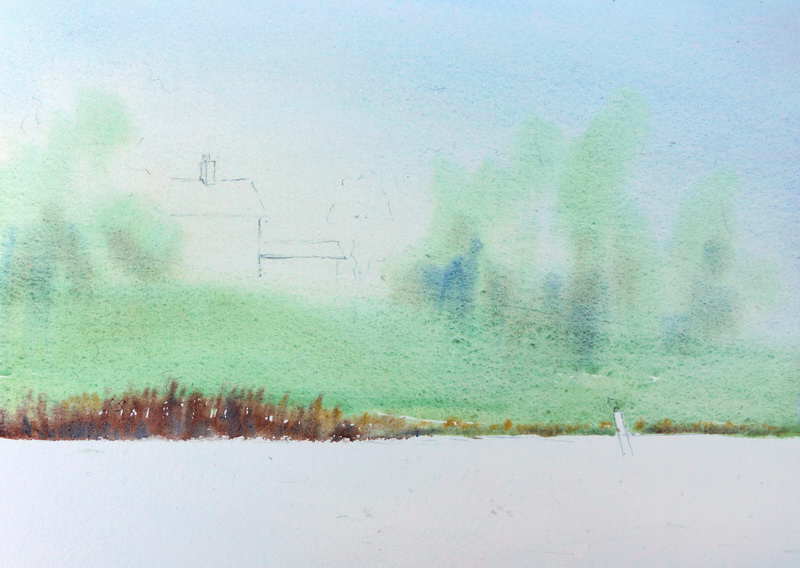 The initial under painting was similar to that done in the pen and wash version. Once this was totally dry I painted the distant cliff faces alternating light and dark, cool and warm colors to add interest. This also gives the impression of sunlit and shadowed sections of the cliff. After painting the cliff faces I added some additional green color to the hill below it. Initially the under painting of the hill was too light and the cliff faces looked like they were floating on air. The extra paint strengthened the hillside tone which fixed it. 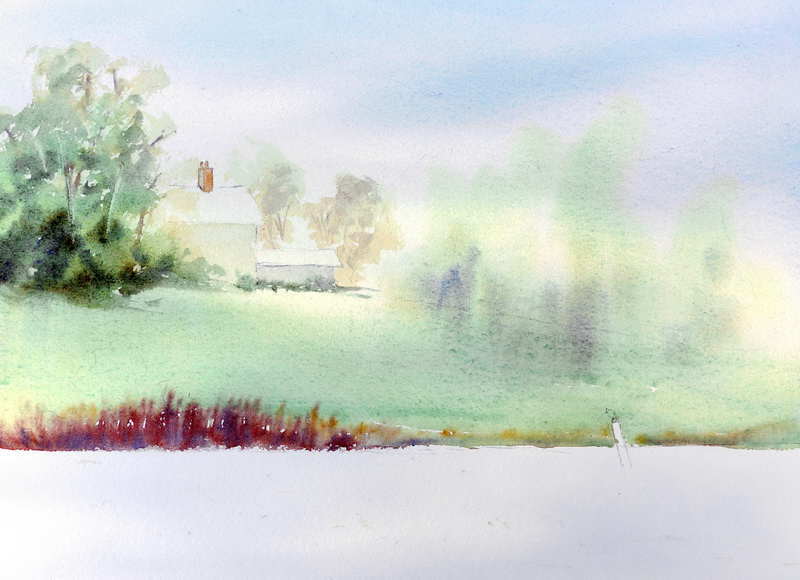 Next came the distant trees moving towards the middle distance trees with stronger (thicker mix) watercolor paint. I let this stage dry. I now painted the featured gum tree starting with the foliage and painting the trunk while the foliage was still wet in places. I also painted some branches in the top right hand corner of the painting. These branches on the right hand side add to the feeling of space in my painting by implying more trees outside of the field of view in the painting. I let the painting dry fully before finishing it with the shadows as before. The shadows are painted with French Ultramarine and some Permanent Alizarin Crimson, the mixture leaning towards the blue not the red. Figure 3 is the finished work. 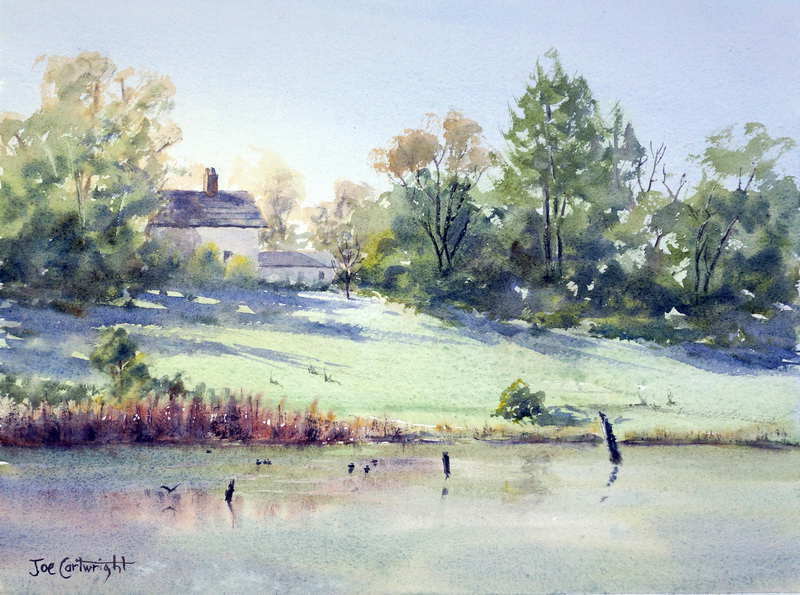 The sky is usually the lightest part of your painting – better too light than too dark. If you paint your sky to strong a tone then you will have to paint other parts of your painting even stronger which will reduce the transparency of your painting i.e. if it your paint has to go on too thick to retain its correct tonal relationship amongst its various parts. This is a simple and maybe obvious point but it is still very important.